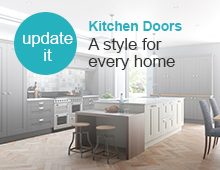 Highest quality round cupboard bin, this timeless classic is available in three finishes. 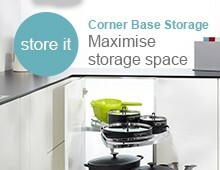 A superb built in bin which can be mounted on the left or right wall of the cabinet, the benefit of this is; it avoids strain on the door's hinges. 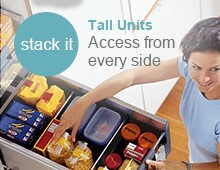 This cupboard bin has a patented antibloc system, which protects the bin from jamming the door. 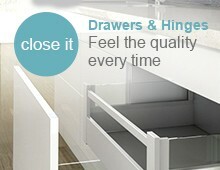 Simple to use - open your cabinet door and the bin swings open too. 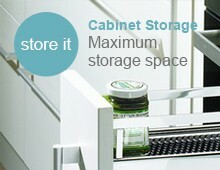 The lid remains within the cabinet, when the door is open and then seals when closed. The round bin if required, can be easily removed from the door to allow door cleaning. 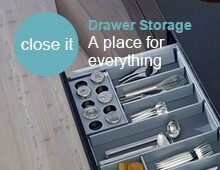 Cupboard bin comprises of one removable container for simple emptying and cleaning.